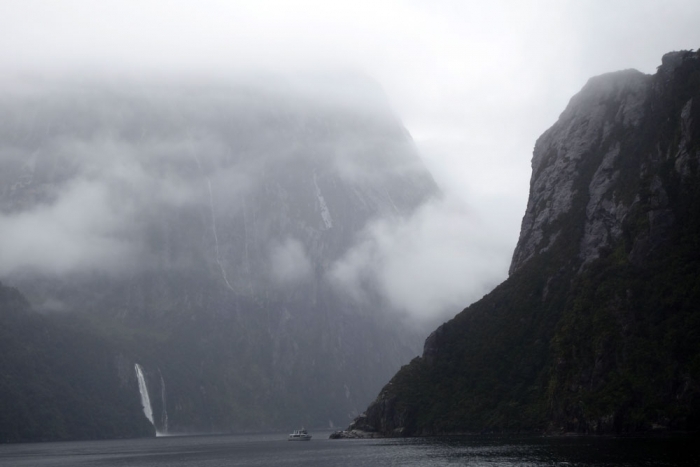 Is it worth visiting Milford Sound on a rainy day or should you not bother? We ended up visiting on one so let me fill you in on what it's like! It apparently rains at Milford Sound a lot; the tour guide said it was something close to 50% of the year and one of the rainiest parts of the country (Caveat: poor internets - not researched!). Like I would imagine most travellers to the region, we weren't able to assign multiple days to the area to make sure we could see it on a good day and also had booked the tour boat in advance which meant when we woke up to a rainy day, we knew we were going to get to see Milford Sound in the rain. I wish we had had a good day to compare but in all honesty the tour-boat cruise through Milford Sound on a rainy day isn't as bad as I had feared. I bet the views are astounding on a clear day but the low clouds clinging to the mountains and huge bodies of rock looming out of the grey mist around you is a really cool experience in itself. We, unlike our fellow passengers on the slightly underpopulated boat, tried to stay out on deck as much as we could (poor Lisa possibly being dragged out by me running around with a camera) but it meant that we had the entire top of the boat (and pretty much the rest of the outer deck) to ourselves which was kind of nice. I will admit that the cold did drive us inside for a bit of recuperation about two thirds of the way in but as soon as there was rumour of a penguin spotted Lisa (who is a fan) was back out on deck! Our chosen tour was 'Go Orange' as they had reduced prices all through October, had a 2 hour cruise and offered a free snack on board (fish and chips if you did the 12:30pm cruise which of course we did!). Again, our ability to compare is limited but the crew were friendly, the skipper (and guide) was great and informative and the boat seemed in great condition! 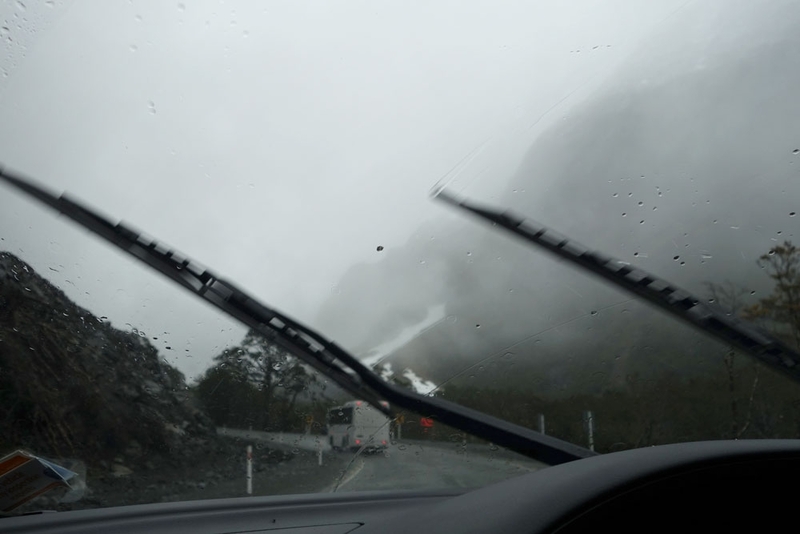 So the cruise wasn't too bad in the rain, but the one thing that I was really disappointed we couldn't experience properly as a result of the weather was the drive to Milford Sound from Te Anau (or in our case, Cascade Creek campsite, halfway up). The drive just north of our camp and up all the way to Milford Sound is said to be one of the most beautiful drives in the world but wit our limited visibility we could only grab peaks of the incredible geology that surrounded us. I could have lived with the 'mysterious Milford Sound' experience, with the cruise shrouded in cloud, but it was a real shame to miss such highly acclaimed views on the way there. 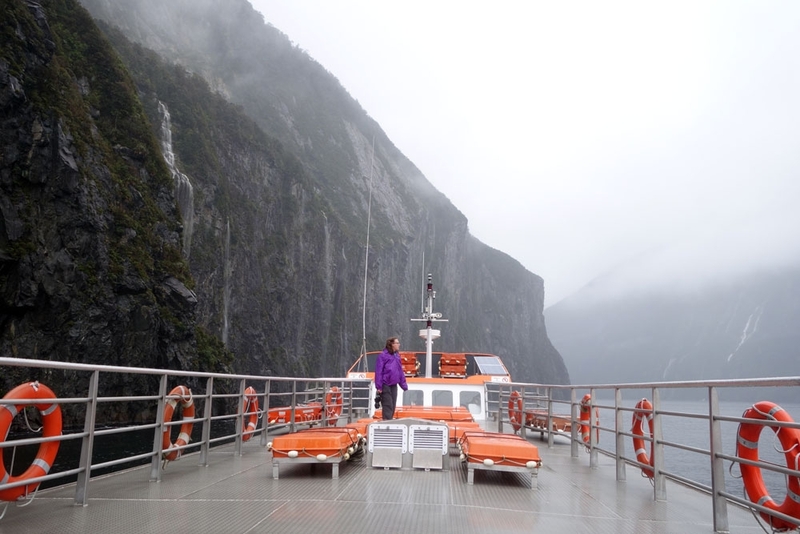 If you have only one shot at Milford Sound and you are looking at a bad forecast, don't think it is the end of the world - it will still be a really cool experience if you make the most of it, get wrapped up and waterproofed and brave the desolate deck of your tour-boat. I still think that I'd be fooling myself if seeing it in the wet was nicer though - a clear day gives you both the cruise and the incredible drive alongside it. It is weather though and your experience is always what you make of the situation so expect the worst (which really isn't that bad!) but hope for the best!